Here in the mountains of Western North Carolina, we’re known for our creative arts and crafts community. Our artisans are keeping alive many of the traditional heritage crafts such as pottery, weaving, basketmaking and quilting; as well as cooking, canning and preserving to make best use of locally grown foods. Stores and galleries in the area offer these crafts and more for sale; and we have several festivals featuring locally made crafts as well. If you would like to learn how to create some unique crafts, the artisans on this page would like to teach you. We have a variety of classes — from 2 hours to several days or ongoing. Nourish your creative spirit – learn something new! 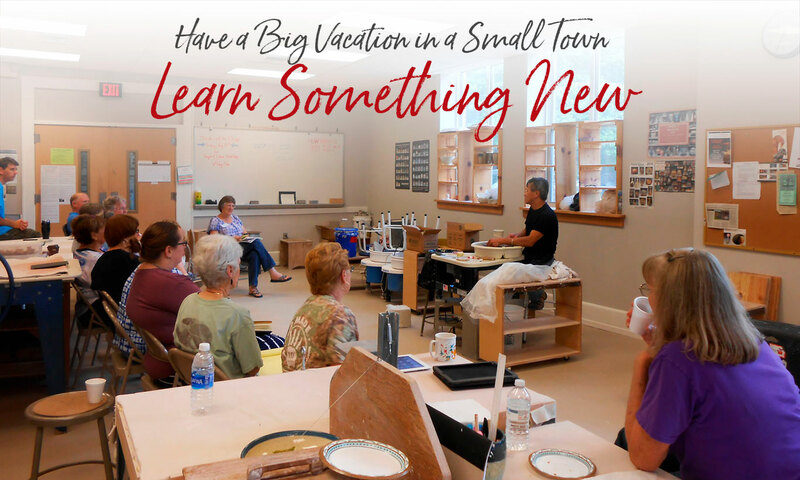 SCC's Nantahala School for the Arts at Swain Center focuses on heritage arts including a Master Potter certificate program, as well as outdoor leadership and business and industry training and consulting. Several classes for children are offered in the summer.